Here’s the short answer: we do like living in Shenzhen, China! As for the detailed answer, read on. Why do you like living in Shenzhen? Shenzhen is a huge city of over 12 million people, but it’s very well developed and easy to navigate. 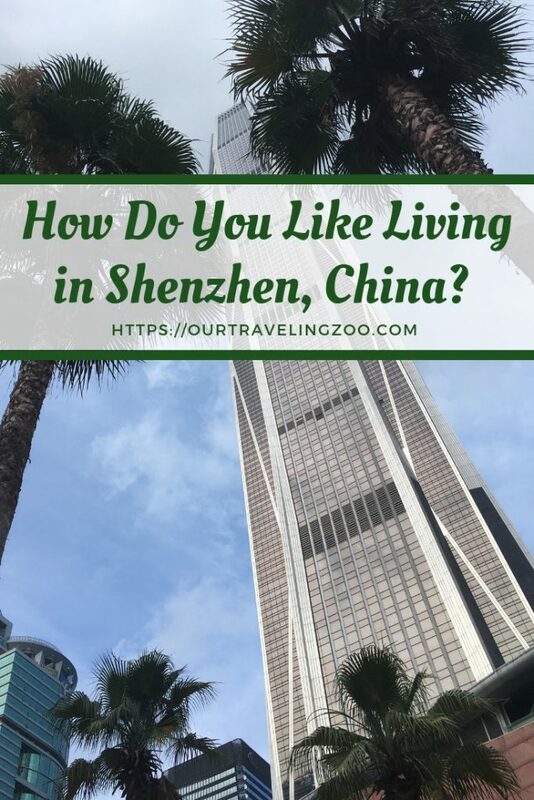 Main streets are wide, traffic is generally orderly, which is fairly unusual in China’s cities, and Shenzhen has got a great public transportation system. There’s a lot of green space, too, meaning we can take the kids to good parks or on nice hikes. The northern part of Shenzhen, known as Xili. This area is home to a major reservoir, as well as a university, and it isn’t as de self populated or developed as the southern part of the city. If you were to turn and look to the south, instead of north, you could see across the bay to Hong Kong on a clear day. You don’t need a car if you want to live in Shenzhen. We’ve been here for two years and have never felt bad because we don’t have one. There are English announcements and pinyin or English signage on the metro system and buses, and the public transportation system is excellent. As a result, we find getting around fairly easy. Public transportation can make a short trip take quite a while, however, so we use taxis sometimes. Another option for getting around would be to use one of the several bicycle rental services offered in the area, but we don’t because we’ve got the little ones with us. Are taxis expensive in Shenzhen? Taxis are not expensive in Shenzhen when compared to taxis in the United States. The most we’ve ever paid for a fare was when we went to Shenzhen Fairy Lake Botanical Garden last week and paid 200 kuai (about $30), and that was for an hour and a half long ride in a 6-passenger van from the upscale service offered by Didi. Didi is China’s Uber. It makes getting a taxi very easy most of the time, and cuts down on communication hassles. Download the app, connect it to a Chinese bank account or your credit card from back home, and bada-boom, you’re ready to ride. Speaking of hassles, how do you communicate with taxi drivers in Shenzhen? Well, learning a few phrases in Chinese, such as our address, has helped make communicating with taxi drivers a lot easier, but even without knowing Chinese, it’s always possible to carry a card or a photograph of the address we need to get to. Usually drivers can read it and take us there. Using Didi helps reduce communication headaches, though, as you request a ride to and from a specific location within the app. There’s also the option of sending text messages within the app to a driver which are translated into or out of Chinese. Not least, there are lots of translation apps offering the ability to translate spoken language, and they can work pretty well. 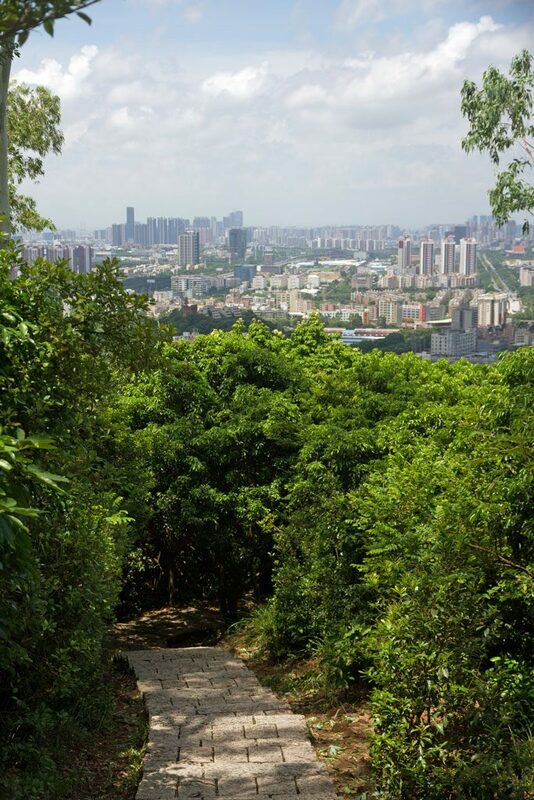 One of the trails (that is, stairways) on Tanglang Mountain in Nanshan, Shenzhen. For a better answer, check out our post about that. In short, it varies a great deal based on what you want to do. If you’re after all the comforts of home, you’ll pay a lot for that luxury. If you’re willing to adapt to the local way of life, especially in terms of food, you will find the cost of living to be very reasonable. What if I want to live in Shenzhen on a tight budget? Living on a budget in Shenzhen is made easier if you can learn to navigate some of the websites and apps that Chinese people use. Taobao is made accessible for non-Chinese speakers by using Google’s Chrome browser, which can translate from Chinese. Taobao is China’s Amazon, and it has just about anything you could want, frequently at a steep discount. Using WeChat and learning some of the many mini apps available in it can enable purchases of train tickets, movie tickets, and the like, at reasonable rates. We live here with one not-very-high income and saving money is no problem. What are parks like in Shenzhen? There are lots of parks in Shenzhen. Like we said, one of Shenzhen’s strengths is the number of green spaces. On weekends, the parks are full of people enjoying the outdoors. The parks often have wide open fields surrounded by trees, giving lots of room to frolic or fly kites. Usually there are paved walkways and exercise equipment. What’s more, most parks have a nice children’s area, too, with sandboxes, playgrounds, and the like. 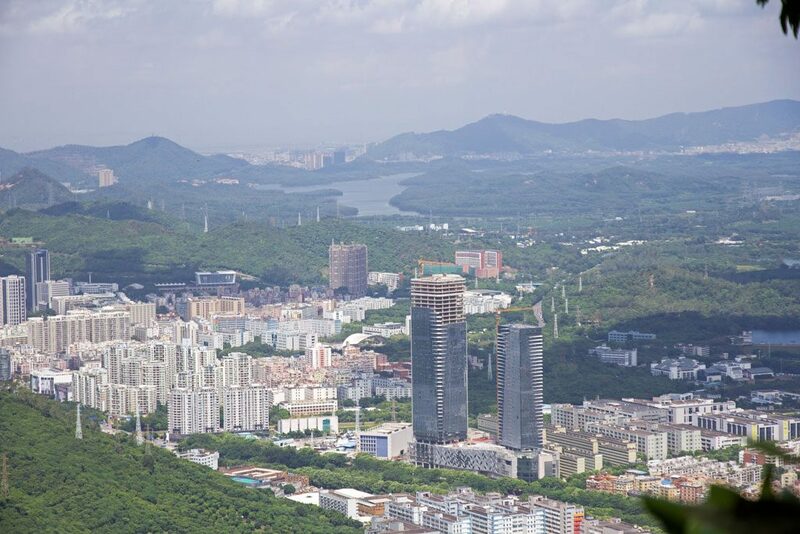 There are also lots of hiking trails in the ridges that dot the landscape of Shenzhen, making it easy to scale mountains like Nanshan or Tanglang, both of which offer marvelous views of the city and Shenzhen Bay. 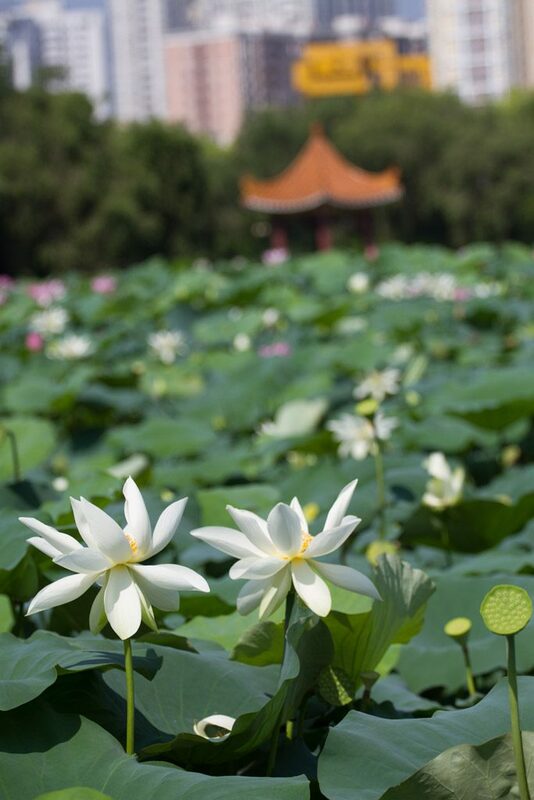 Lotus plants blossoming in June at a park in the Luohu district of Shenzhen, China. Are there drawbacks to living in Shenzhen? Of course there are drawbacks to living in Shenzhen. It is not some sort of paradise. The greenery that fills empty spaces here is lush, with huge leaves and crawling roots that characterize subtropical climates. It’s very beautiful. However, this is a hot, humid area, and it includes all the hallmarks of heat and humidity that can be frustrating. Take, for example, recurring issues with mildew or mold. We have to place high-capacity moisture-absorbers around the place, and keep the air conditioning running more or less all the time to try to prevent mildew or excessive moisture buildup in our place. Even doing this, we’re not always successful. Another drawback to life in this big city is the noise. We’ve written a post about this you can check out here, but suffice it to say that this place is (perhaps unsurprisingly) loud, and that can be frustrating. Air pollution is a constant big bummer in China, and while Shenzhen is among the least polluted of China’s big cities, it’s still got days when the air is unhealthy. Lately, we’ve had a string of really nasty, hazy days, with AQI in the 180 range, and that’s no good at all. Truly, it’s enough to make us think twice about living here. 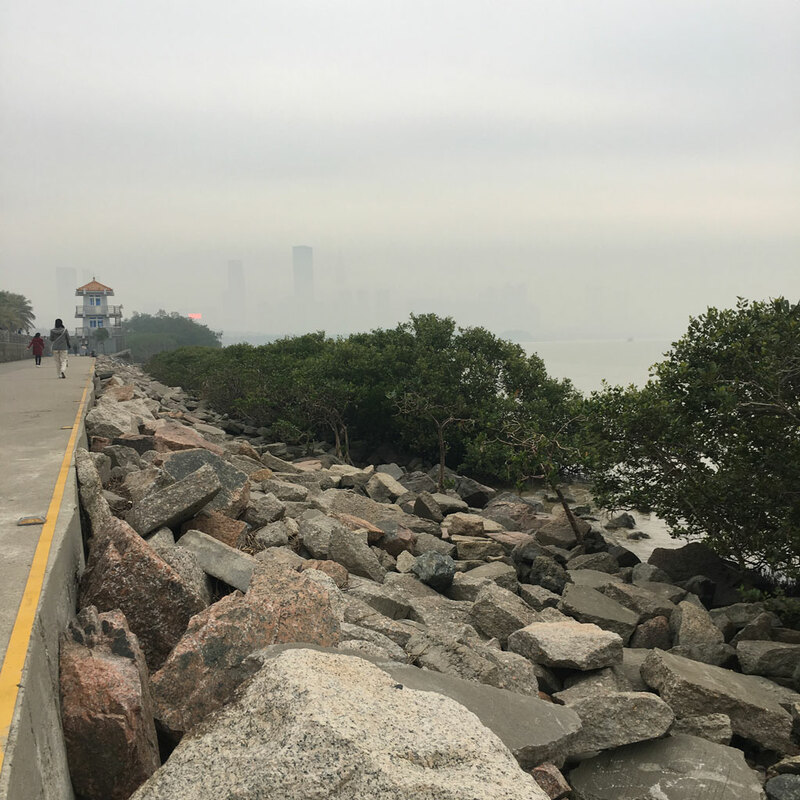 Taken on a foggy, smoggy day, this picture is of the popular Shenzhen Bay waterfront. Mangroves are visible to the right, and most days, you would see much of the city ahead. A final point that can cause a bit of consternation living in Shenzhen is the Great Firewall. It is hard to access Western websites on the World Wide Web, which results in a significantly different, more closed-off atmosphere than Asian countries like, for example, South Korea, or Hong Kong, which is technically part of China, despite the border and very different governmental policies. Of course, this means accessing information and using familiar Western websites can be a challenge. In all, we like living in Shenzhen, China. It’s a modern city that is easy to navigate, even for non-Chinese speakers. It’s reasonably affordable to live here, and Shenzhen has plenty of parks and nature trails which allow us to do things outside. There are some drawbacks, of course, but we find them outweighed by the greater number of positive aspects of life. Pictured is the world’s fourth tallest building, located right in the heart of Shenzhen, China. How about pinning it? If you’d like to read more about our experiences here, check out our Life in China series.